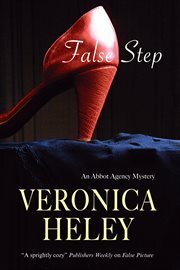 The item False step, Veronica Heley represents a specific, individual, material embodiment of a distinct intellectual or artistic creation found in Evansville Vanderburgh Public Library. Bea Abbot's domestic agency does not, repeat not, investigate murder . . . that is, until she finds herself in the company of a dead man dressed as a pantomime dame. It looks like suicide, but why don't his red-spangled shoes fit? Why is the man's daughter so keen to hustle his mortal remains away without publicity? Then again, which of the women around him' two surviving wives and a daughter' really cared about him, rather than his money? . .